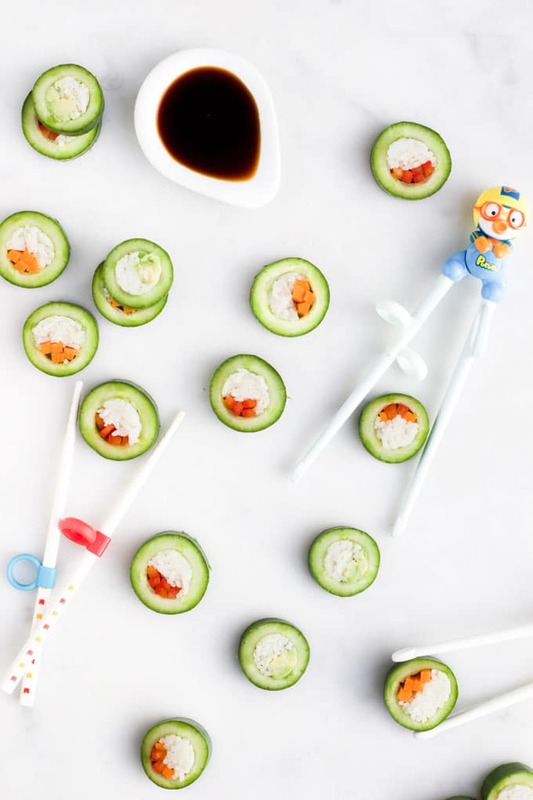 Cucumber sushi is a healthy, fun and delicious snack for kids. It is quick to prepare and easy to customise to suit taste. 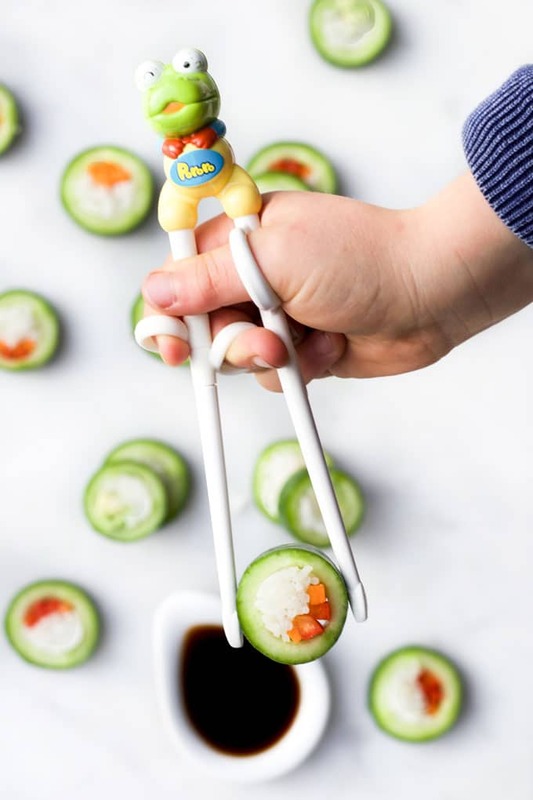 If you have a child that doesn’t like sushi, due to the seaweed, then this is a perfect alternative. The hardest bit about making this version of sushi is probably the filling of the cucumber. Once you get the knack of it though, it really is very easy. The first step is to core your cucumber. Slice off both ends of the cucumber. Chop your cucumber in half. 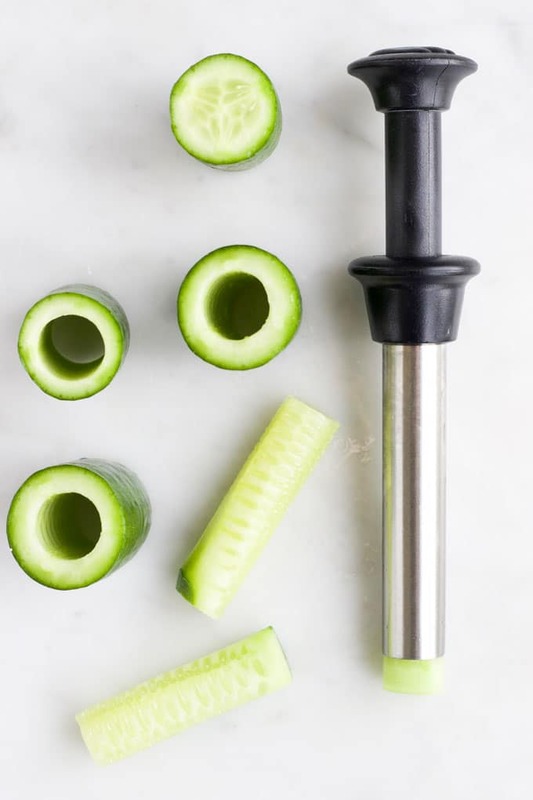 Remove the center of each cucumber half using an apple corer (see below photo). Note: Don’t throw away the centers! My kids usually fight over the center parts (they will fight over anything and everything) but you can always chop them into salads or add to a juice/smoothie. The next step is to fill the cucumber. I find it easier to fill the cucumber with the vegetables first. Trim the vegetables to the same size as the cucumber pieces and then place them in at the side. Fill up the remaining space with the rice, making sure it is compact. Using a sharp knife, slice into rounds. What Variety of Cucumber Should I Use? In this picture, I have used Lebanese cucumbers. I have also made it using English cucumbers. You can use any slicing cucumber. Just make sure it is wide enough to core easily. What Rice Should I Use? 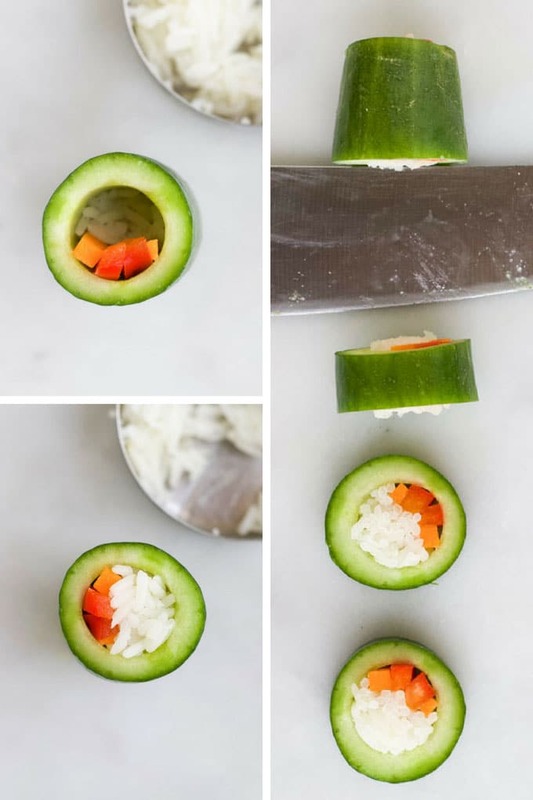 Sushi Rice is obviously a good option for making cucumber sushi. However, I only really make this snack when I have leftover rice. I never purposely make rice just to make cucumber sushi. Chilled rice works best, you want it to be sticky enough to clump together. I usually use jasmine rice (used in pictures). Uncooked rice often contains the bacteria Bacillus cereus. These bacteria can form protective spores that survive the cooking process. If the rice is not chilled properly then the bacteria spores can germinate, grow and produce a toxin that causes sickness. This snack should use properly chilled rice and then, once prepared, should be stored in the refrigerator. If adding to a lunch box it is important that the lunchbox is properly chilled, to ensure the rice is kept under 5C. Have you tried this recipe? I love hearing your feedback. Rate and leave a comment below or tag me on Instagram or Facebook. A delicious, healthy and fun snack for kids. Add around 4 slices of capsicum or carrot (or a mix of both) to the center of the cucumber. Then stuff with rice to fill the cavity, pushing the rice down to ensure the cucumber is fully stuffed. Cut into sushi slices and serve. The type of cucumber you use is up to you. I have used both English and Lebanese cucumbers to make this snack. Just make sure the cucumber is wide enough to remove the centre and stuff easily. I usually make this snack when I have leftover rice (jasmine rice pictured). Chill the rice and clump together. You can fill with different vegetables or proteins like tuna or chicken. As long as you properly fill the cucumber it should work well. If you do not have an apple corer you can use a teaspoon to scoop out the seeded flesh part. It just won't have such a clean look. Keep this snack refrigerated, rice should be stored under 5C. Nutritional information is a rough GUIDE only, calculated using an online calculator. The results are based using Lebanese cucumbers and Jasmine Rice and are for 1 slice only. The results will vary depending on the rice used and size/variety of cucumber/fillings. 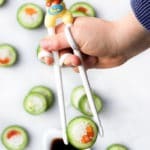 I loved the recipe, and pororo sticks are incredible, where did you buy them? Thanks for sharing!! Thanks Daniela! I think I got the sticks in Daiso, they are too cute! Looks super easy and it’s great for a healthy lunch! I will give this a go! This is such a cute idea! Do you think it would work with tuna salad in place of rice? Hi Lindsey, yes I think it would work. As long as you pack the cucumber it should hold well. The kids had fun making these, we used a rice and quinoa mix which worked well.